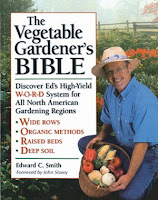 The Vegetable Gardener's Bible. Edward C. Smith. Highly Recommended. The first section is the most detailed. This is where the author lays out the basics for his WORD method. Along with several other sources, this is was the main inspiration for building my framed raised beds. There are several great chapters in this section that describe planning and executing your garden. This section covers the basics of soil, composting and organic pest control. While not as detailed as the books to each of these topics, it gives a good overview. This section features the obligatory plant profiles that most garden books seem to provide. It truly does have quite an extensive selection of edible plants, with over 100 pages dedicated to this chapter. Each profile has a wide range of data, from planting and harvesting information to the best varieties to use. All in all, this book is a great resource for both beginning and seasoned gardeners.